Fellow Lardy James Tree has been converting the scenarios in the Chain of Command Operation Martlet pint-sized campaign pack to I Ain't Been Shot, Mum, and posting the results on the IABSM Facebook page. Here's the report from the second scenario in the pack: troops from the British 49th Infantry Division push on against some rather battered opponents from the German 12th SS Panzer Grenadiers. See how they get on by clicking on the picture, below. Best of all, James makes it easy for you to play the scenario yourself. Please do...and send your own AARs in to admin@vislardica.com. In addition to publishing the company-sized WW2 game I Ain't Been Shot, Mum, the TooFatLardies also publish the very popular platoon-sized WW2 game Chain of Command. In addition to the rules, TFL also publish a series of "pint-sized campaigns": scenario booklets for CoC that cover very specific actions over the course of 6-8 games priced, as the name suggests, at the price of a pint of beer. One such booklet covers Operation Martlet: the combined arms operation launched by the British 49th Division immediately prior to Operation Epsom to seize the Rauray Spur from the defenders from 12 SS Hitlerjugend. The pint-sized campaigns can be fairly easily translated for use with IABSM, and this is what James Tree has done for his latest AAR, lifted from the TFL Facebook page. Although this site concentrates on the company-sized games from the TooFatLardies, I like to keep you all abreast of their other activity. Today, for example, saw the release of the Citadel, the Breakthrough pint-sized campaign for Chain of Command. "This Pint Sized Campaign for Chain of Command is the second covering the decisive battle of Kursk in 1943. The action here covers the attack of the Grossdeutschland Division on the Soviet Second Defensive Line. This key action will either see the Germans breakthrough and head onwards for Kursk, or be stopped by the Soviets; whoever wins will seize the initiative in the East for the rest of the year and possibly change the course of the war. "Six battlefields provide a campaign which sees the Germans attacking and the Soviets but with the Russians counter-attacking to buy time. This campaign can be fought as a stand-alone series of games or can be played as a continuation from the first Kursk Pint Size Campaign, Storming the Citadel. "This classic Pint Sized Campaign is designed to be run using the campaign rules in At the Sharp End and with Chain of Command rules. Can you seize the initiative and put the Soviets on the back foot while you build up your defences or can you keep up the momentum of the attacks in the East as you drive relentlessly towards Berlin? "Thirty-two pages long, this Pint Sized campaign provides the background history to the campaign with situation maps. Uses period maps to show the location of the actions and then provides a complete campaign with forces for both sides, support options for players to select from and full victory conditions for all six battles and the campaign as a whole." At time of publishing, Citadel was on sale for only £3.80: actually less than the price of a pint in some of the places I go! You can order and download your copy by clicking here. Although this site tends to cocentrate on the company-sized games from the TooFatLardies (IABSM, CDS, Q13), we do like to promote new releases for their other systems. "This Pint Sized Campaign for Chain of Command is the first covering the battle of the Bulge. The action here covers the initial German attack against the US 28th Infantry Division as the 26th Volksgrenadier Division attempt to clear the ground between the Our and Clerf Rivers in preparation for Panzer Lehr’s advance on Bastogne. What followed was three days of epic action which destroyed the German chances of victory. Thirty-two pages long, this Pint Sized campaign provides the background history to the campaign with situation maps. Uses period maps to show the location of the actions and then provides a complete campaign with forces for both sides, support options for players to select from and full victory conditions for all six battles and the campaign as a whole." Click here or on the picture of the front cover to buy "Bloody Bucket". Although this site is mostly dedicated to the TFL company-sized games (IABSM, CDS, Q13) I like to publicise what else is going on at Lard Island. 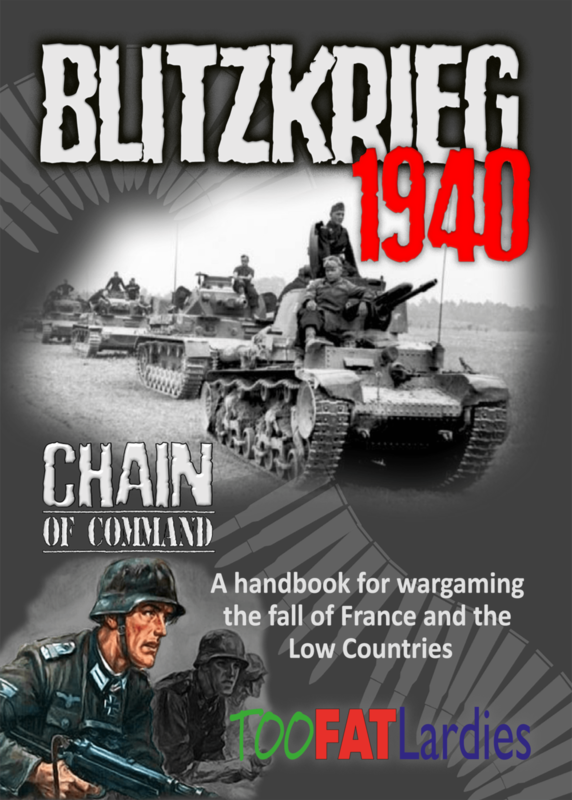 It therefore gives me great pleasure to announce the publication of the latest pint-sized campaign for Chain of Command, the platoon-sized WW2 game. "This Pint Sized Campaign for Chain of Command is the first covering the attack of PanzerGrenadier Division Grossdeutschland at Kursk. The action here covers the build up to the attack, with actions in no-man’s-land as the Germans attempt to seize observation posts and clear minefields, followed by the first day of this epic battle as the Germans storm through the Soviet outpost line and the first line of defences. "Six battlefields provide a campaign up to ten games long, by which point you’ll have a clear winner and be set up for the next campaign in the series which is already being prepared and follows Grossdeutschland into the second line of Russian defences and attempting to break into open ground beyond. "This classic Pint Sized Campaign is designed to be run using the campaign rules in At the Sharp End and with Chain of Command rules. Can you breach the Russian defences and seize the initiative in the East, or will you defeat the fascist invaders and restore the safety of the motherland. "Twenty-seven pages long, this Pint Sized campaign provides the background history to the campaign with situation maps. Uses period maps to show the location of the actions and then provides a complete campaign with forces for both sides, support options for players to select from and full victory conditions for all six battles and the campaign as a whole." You can buy Storming the Citadel for the pint-sized cost of £3.80 by clicking here. Chris Stoesen, author of the Campaign for Greece, Call this a Ruddy Picnic (East Africa), and In the Name of Roma scenario packs for IABSM, has just published a new supplement for Chain of Command. "The Campaign for Kharkov contains two pint sized campaigns. One covers the advance of the German 57th Infantry Division and the other the German 101st Light Division. The attack came in October of 1941. This city would be the site of three major battles for the city. The interesting aspect of the October 1941 battle is in the nature of the troops involved. The Soviets had superiority in armor. The Germans advanced with only a single STUG battalion in support of the 57th ID. The Soviets fielded the T34 as well as several improvised armored vehicles such as the KhTZ-16. While not a success on the battlefield, it demonstrated the Soviet inventiveness under the extreme pressure of the blitzkrieg. "There are twelve total scenarios in the campaign. Full force lists are available for both German Divisions and the Soviet troops present. Maps are based on aerial reconnaissance photographs taken by German troops in September 1941. "The scenarios are availible from my blog at $6.00 US. PayPal the money to cstoesen@corecard.com and I will email you the PDF. Or you can order them from Wargames Vault for an instant download for $7.00 US. Note that a Kindle and a hard copy will be available on Amazon within the next couple of days. Stay tuned." Go to www.toofatlardies.co.uk to get your copy today! "Two of the things we are regularly asked for are a set of Patrol Markers and a set of Jump-Off Points for smaller figures such as 20mm or 15mm. We thought it would be a great idea to kill two birds with one stone and, in partnership with our chums at Warbases, we have produced sets of eight markers for both the Axis and Allied forces. Each set contains four robust MDF Patrol Markers with either the Allied star or German Baltic Cross. The four Patrol Markers are 5cm diameter circles and four smaller jump off points are 3cm diameter. Both are in 3mm MDF laser cut and etched for each painting. "Here’s what they look like “naked”. "I decided to slap a bit of paint on my own sets. I went with a black undercoat for both before applying Vallejo Russian Uniform Green to the Allied ones and Middlestone to the Axis ones. I then added some camouflage to the German one before detailing the Allied Star in white and the Baltic Cross in black. The German one then got a yellow rim to make it stand out on the table. On reflection, I think I might do the Baltic Cross in white and maybe replace the yellow with a bright red. Early War Panzer grey would be a nice look too. Part of the fun is deciding how you like yours! "The best news is that both the Axis and Allied sets are now available on the web site for just £3 each. Now, there’s a stocking present for you!" You can buy the Allied marker set by clicking here. You can buy true Axis marker set by clicking here. Yesterday saw the release of another pint-sized campaign scenario book for Chain of Command: The Scottish Corridor. This supplement focuses on a German counter-attack on the salient held by 15 Scottish Division on the Odon river in the latter stages of the war. As ever, it is available for £3.60: the price of a pint in Richard's local. "The Scottish Corridor is the fifth Pint-Sized Campaign for Chain of Command, designed to be played using the campaign handbook, At the Sharp End. "Twenty nine pages long, The Scottish Corridor follows the established Pint-Sized Campaign format, with an overview of the forces involved on both sides, their deployment shown on period maps and the course of the campaign described in detail before going on to present a mini-campaign covering the initial German counter-attack against the narrow corridor projecting down to the Odon river and Hill 112. A mixed force of two Kampfgruppe attack in the hope of isolating the British spearhead and restoring the line. "The campaign is a total of six game tables with the duration running between six and eleven games. Briefings are provided for both sides, along with measurable objectives, period maps, force and support option listings and everything you need to play this campaign through to its conclusion. "Like all of our Pint-Sized campaigns, this is available for the price of a pint in our local pub. We're sure that you'll agree, that is great wargaming value!" You can buy The Scottish Corridor from here. Although we don't really do Chain of Command (or CoC, as it's known) on Vis Lardica, I've played the game a handful of times and always had a great deal of fun. I'm pleased, therefore, to post about the latest TFL "pint-sized campaign" scenario pack for CoC, Operation Martlet, released today. "Operation Martlet is the fourth of our Pint-Sized campaigns for Chain of Command, designed to be played using the campaign handbook At the Sharp End. "Twenty eight pages long, Operation Martlet follows the established Pint-Sized Campaign format, with an overview of the forces involed on both sides, their deployment shown on period maps and the course of the campaign described in detail before going on to present a mini-campaign covering this combined arms operation launched by the British 49th Division immediateloy prior to Operation Epsom to seize the Rauray Spur from the defenders from 12 SS Hitlerjugend. "Like all of our Pint-Sized campaigns, this is available for the price of a pint in our local pub [Editor's Note: £3.60 at time of posting]. We're sure that you'll agree, that is great wargaming value!" Click here to go straight to the TFL shop and buy Operation Martlet. I don't often post about the TFL WW2 platoon-level game Chain of Command as this site is really reserved for TFL's company-level games. I do, however. enjoy a nice game of CoC every now and again, so am happy to help Rich promote the "Chain of Command Challenge": a 20%-off offer on the rules, whatever the format. To take part in the Chain of Command Challenge you can find the rules at this great introductory price on our web site here: Chain of Command Products. 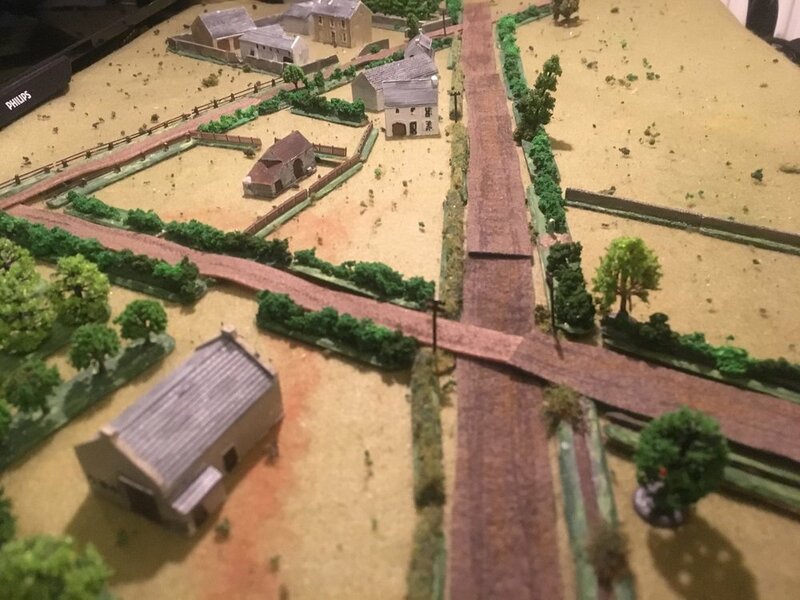 And just to make things a bit more fun, we’d love to see your reports on your blogs, Facebook or Twitter feeds (hashtag #spreadthelard ), on the TooFatLardies Forum or Yahoo Group, or simply post your comments in a reply to this post. Why not take the Chain of Command Challenge today? Old Hickory, released today, is the third of the Pint-Sized campaigns for Chain of Command, designed to be played using the campaign handbook At the Sharp End. Thirty pages long, Old Hickory contains an overview of US operations in Normandy and beyond from Operation Cobra to the German counter attack at Mortain, Operation Luttich. It goes on to present a mini-campaign covering the defence of L'Abbaye Blanche, a key position to the North of Mortain where the US 30th Division stood firm against 2nd SS Das Reich, and Der Fuhrer regiment in particular. Now available at only £3.60 (the price of a pint!) at www.toofatlardies.co.uk. Hopefully the next special will contain a conversion for IABSM as the Christmas Special 2014 did for the first Pint-Sized Campaign for Chain of Command, 29! Let's go! Just a quick note: the TooFatLardies have just published the second of their pint-sized campaigns for the WW2 platoon-level game Chain of Command. "Kampfgruppe von Luck is the second of our Pint-Sized campaigns for Chain of Command, designed to be played using the campaign handbook At the Sharp End. "Thirty pages long, Kampfgruppe von Luck contains an overview of the British airbrorne landings and the response of 21 Panzer Division on D-Day before then going on to present a mini-campaign covering the first counter-attack by Kampfgruppe von Luck, striking for the bridges on the Orne. "The campaign is a total of five game tables with the duration running between five and eight games. Briefings are provided for both sides, along with measurable objectives, period maps, force and support option listings and everything you need to play this campaign through to its conclusion. Hopefully the next Special will contain a conversion guide for IABSM! You can order KvL by clicking here. The Eagle Has Landed...I Think! I went over to Lard HQ last night for the final game of the year, billed as a Chain of Command re-fight of the climactic battle from the film The Eagle Has Landed. For those of you who have missed out on this cinematic masterpiece, Michael Caine leads a bunch of Fallschirmjaegers on a mission to assassinate Winston Churchill as he visits a small village in rural England. All is going well for the Fall-ies, who are disguised as Polish Paratroopers, until one of their number saves a local girl from going under the wheel of a water mill but is killed in the process, with his paratrooper uniform being ripped to reveal his German uniform underneath. Now discovered, Caine's men fight a battle to hold the village against an assault by nearby-based American troops whilst Caine himself (Steiner IIRC) goes off to kill Churchill. The game, therefore, featured me leading three squads of US infantry supported by a Staghound armoured car into the village to firstly find out what was going on; secondly to identify any disguised Germans; and, thirdly, if any were found, to kill them! The Germans, meanwhile, who were already occupying the village, had some convoluted mission requirements that seemed to involve tracking down a local woman who was actually one of their spies in order to be told where the secret tunnel was that led to the mansion house where Winnie was staying. I say convoluted because everything for the Germans seemed to get more and more confusing as the game went on: surely nothing to do with the immense amount of champagne that Mr Clarke, who was allegedly running the game, consumed as the evening went on. After my last Lard HQ Chain of Command debacle (which no-one seemed to have forgotten unfortunately) I was determined to redeem myself. Rather than following the course of action from the film (where the Yanks charge into the village and get shot to bits before retreating for a more cautious second approach), we arrived at the edge of the village and cautiously moved forward towards the first house in order to try and find out what was going on. There (well in the outside privy to be exact) we met a section of British infantry who confirmed that the Germans did indeed have men in the village, disguised as Polish paratroopers. That was all they could tell us...hardly surprising as they turned out to be more Germans on a mission to stop the main German mission for political infighting reasons. Confused? Not as much as we were when Rich revealed that he'd brought the wrong box of figures with him so we would have to be portrayed using German figures. So we have Germans using British Paratrooper figures pretending to be Polish; more Germans using British infantry figures pretending to be British, and being played by a Scotsman; and Americans using German figures pretending to be...oh, no, sorry: actually being Americans! Anyway, having sussed out what was going on, the Americans went forward cautiously: one squad hanging back as a base of support, one moving towards the church, and one moving up to the Whippet Inn (also somewhat confusingly portrayed by a German beer hall). The squad advancing towards the church took fire from the steeple and lost a man, but our return fire was incredibly accurate and wiped out the German Bren team that were doing the shooting. The squad then started cautiously moving into the church itself. Meanwhile the Staghound moved into a position near the first house from where it could cover the village main street with its .50 cal. The other two squads then leapfrogged forward until one was in the inn providing a base of support whilst the other was pressed against the back wall of the first house in the village, covering both the main street and the gardens to the rear. Stalemate then ensued until the Germans realised that firstly all we had to do was keep them occupied until the end of the game and secondly that they needed to get back into the church to find the woman to find the secret passage to find the Churchill...you get the picture. As false-Polish paras hit the high street, heading for the church, we opened up with everything we had: the Staghound's .50 cal, chewing up scenery as the two squads covering the high street actually did the damage. The first German squad was effectively rendered hors d combat (no, no French on the table...at least I don't think so...but at this stage, a bottle and half in, who knew) but another moved up and threw grenades into the church in an attempt to clear it. This was not as effective as it should have been (one dead American), and the Germans soon suffered as a hail of grenades and small arms fire came right back at them. That squad was soon pinned and then wiped out as well. The game then drew to a close. We occupied the church and commanded the main route through the town; the Germans needed to control both in order to fulfil their mission, but were now down two full squads against our losses of four men (three killed by a demented local high on home brew). All in all, a great game of Chain of Command, if somewhat chaotic. I was quite rightly accused of taking the game far too seriously (it was the Lardy Christmas game, after all) and have no excuse except to say that after last time I had no choice lest my reputation be damaged beyond repair! My thanks to Rich, Nick, Panda, Trevor, Dougray McScot, Al, Noddy, Mark, Harpers, Panda, Elton etc for a most entertaining evening, with mince pies and booze thrown in for good measure. Just make sure you save me an After Eight when the packet is eventually opened!